With its majestic Doric-style columns, intricately carved molding and beautifully detailed 20-foot recessed ceiling, the 700-seat James Simpson Theater at Chicago's Field Museum of Natural History is popular among Fortune 500 companies and other organizations as a prime venue for corporate events. Recently, production design firm Frost Chicago enhanced the nearly 100-year-old space with a very modern addition--a full L-Acoustics surround sound system to complement a new 3D/HD digital cinema projector installed by D3D Cinema. For audio design and installation support, Frost Chicago turned to Milwaukee-based Clearwing Productions, which specified a system built around L-Acoustics' ARCS WIFO and XT Series product ranges. 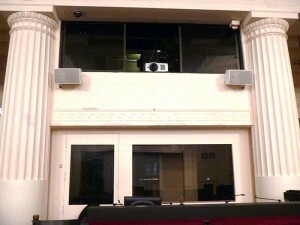 According to Clearwing Systems project manager Megan Henninger, three pairs of ARCS WIDE loudspeaker enclosures were installed at the front of the room for LCR audio reinforcement: two cabinets horizontally flown above both the far left and right sides of the stage with a third pair positioned behind the newly-installed retractable, perforated screen. Four tiny 5XT coaxial systems spread out and hidden behind a dark grille on the face of the stage provide supplementary front-fill coverage to the first several rows of seating while two SB18i subs centrally stacked upstage deliver the low end. For surround, the theater now benefits from a total of ten coaxial 8XTi enclosures all standard-finished in white to discretely blend in with the classically elegant setting. Eight of these are ceiling-mounted between the columns on either side of the room, while two more are positioned at the back of the space for rear left and right channel audio. The entire system is driven by a total of six LA4 amplified controllers. "Preserving architectural integrity was one of the biggest concerns on this project," notes Henninger. "With the historic Field Museum being nearly a century old, most of the surfaces in the Simpson Theater are plaster, but the client didn't want to disturb the look of the room by altering structures or adding acoustical treatment. "Thankfully, the 8XTi surrounds pack a lot of punch in a very low-profile design, and their standard white-finish option allowed them to seamlessly blend into the space. And although the hang points for the main PA were hardly ideal, the precise coverage pattern and sound quality of the ARCS WIDE enclosures allowed them to perform exceptionally well." 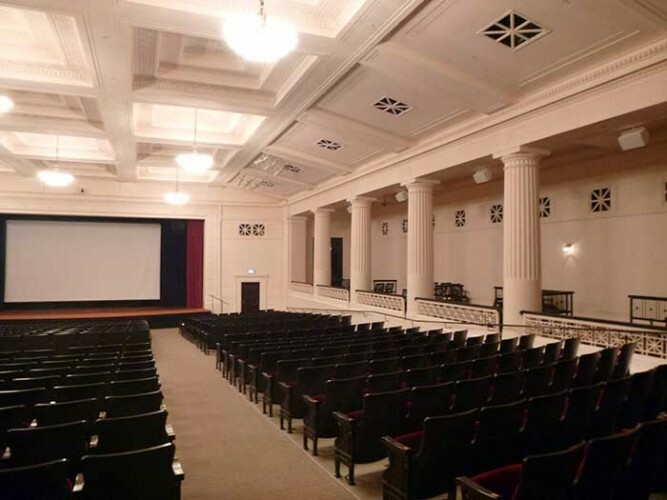 "As the exclusive vendor for production at the Field Museum as a special events venue, the client came to us wanting to increase the amenities and marketability of the Simpson Theater for rental use," says Frost Chicago Principal David Kelly. "Additionally, with the success of the 150-seat 3D cinema on their upper floor, the museum recognized the opportunity to generate additional visitor revenue by creating a second, larger 3D space on the ground floor. "With that in mind, our task was to create a system that could handle a wide variety of potential uses--from shareholder meetings and product launches to concerts and truly immersive 3D experiences--and we knew that L-Acoustics would provide a top-notch solution. We frequently deploy our own KARA rental system for events at the Field Museum's Great Hall and the equipment's integrity and fidelity have always delivered a first-rate experience. Since the Simpson Theater's new system first debuted this past Memorial Day weekend, both D3D Cinema and the museum have been absolutely thrilled with the results." In addition to the sound system, Frost Chicago spearheaded the installation of the theater's screen and soft goods (e.g. draperies) as well as coordinated the related electrical work.